A little over a week ago I got my bi-ennial flight review in. We managed to land at the balloon field and also take the kids for tether rides. Throwing gloves from the balloon at people was a popular activity. Soon after we went to Balloons in June. Unfortunately, it was weathered out and we didn't fly. But since there was a pool, my family was still happy. This is a camera phone photo of one of Iowa Helicopter's Robinson R44's. The photo is somewhat ruined by the camera case blocking out the sides. 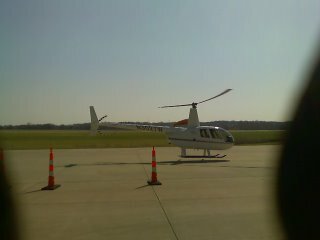 I took a short ride during one of Iowa Helicopter's open houses. I used to know the one of the owners back in my storm chasing days. After I started on my Ph.D., I had to put that hobby on hold. This Sunday was spent with my family at Pinicon Ridge Park. My brother had his fire truck, which was well received by all the kids. Later the afternoon was finished up with paddle-boating. I finally got the balloon up in the air today! Great flight. It was very slow and unpredictable with the high-pressure system overhead. Tomorrow winds could get to 40 mph. I landed in a grass strip between the corn. The photo above is my crew moving me over to a front yard that was near.